At ROI Solutions, we are proud to provide our customers with the best live chat services in the industry. By delivering constant access to real-time live chat support, our highly trained service professionals are available to help and support your Consumers directly from the convenience of your website. Through a transparent interface, ROI agents offer one-on-one interaction with your website visitors – a feature that’s proven to instill confidence in indecisive first-time customers and bolter the trust of your loyal customers. Reliable chat services show all website visitors that your company is dedicated to providing quality customer support in a quick, wait-free manner. With ROI Call Center Solutions Live Chat Services your company can outshine competitors by offering dependable, genuine outsourcing customer support that helps retain the thousands of customers who would otherwise abandon your site due to unavailability of help. Using ROI Solutions’ Live Chat Support benefits your company in multiple different ways. 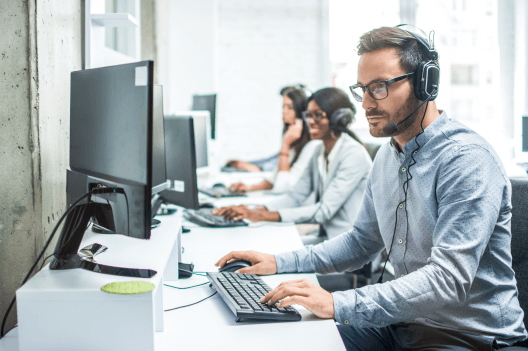 Not only can you establish your brand as one with superior customer care standards, but you can also provide these essential services at a fraction of the cost of running your own call center or independent chat room. Live chat is an easy way for customers to communicate with a business and get answers to any of their questions. When you live chat with an in-house team of experts, you not only get quick responses to your inquiry, but you have access, 24/7! No more waiting 48 business hours for a reply to your email–it’s that quick. More and more companies across the world are starting to outsource their live chat support. It provides them with an easy yet efficient way to provide 24/7 customer service. For many businesses, it also allows them to market new products and services through lead generation and lead follow-up. Along with live chat for your website, ROI Solutions is committed to helping your company provide unparalleled support for your business via Email Management Services. These services enable your online business to communicate with Internet users in real-time and improve your sales and revenue while reducing costs. As leaders of a multinational company facilitating Customer Support Services for clients across the globe, ROI Call Center Solutions boasts a deep understanding for the importance of placing customers and their needs first. Outsourcing your live-chat options is also about more than just customer services. These services can help with order fulfillment, billing support, real-time website monitoring and traffic analysis, and even order verification. Live chat answering services increasingly convert website visitors into loyal, returning customers. Because your website visitors are greeted immediately in a personable way, they will feel more comfortable and confident with your services. Live chat answering service reps will help answer your potential customers’ questions and concerns, help them learn more about your product or service, and just help them navigate the site easier. This friendly communication ultimately improves customer satisfaction and retention. Live chat outsourcing isn’t just about being available all the time, but it’s about giving your clients real-time customer service. For anybody who has done business with you, trained representatives handle things like billing, product support, shipping updates, and information about promotions. Employing ROI professionals to provide your website with live chat support not only helps foster lasting relationships with new and current customers, but you’ll also build a reputation for providing incomparable customer services in an era of instant gratification. Our highly skilled representatives greet your visitors when they visit your website and assist them through their entire stay. They help them navigate through your site. We will function as a helpline to do away with any confusion the buyer might encounter about the product you are selling and a complaint department customers turn to with questions and problems. Increased customer interaction translates into improved customer satisfaction and generation of incremental revenue per customer. Employing our salesmen on your website also helps you foster relationship with your customers for sustained long term growth. Visitors and customers alike prefer talking to a real person instead of pushing numbers on the phone using automated voice support. Real-human support offers your customers greater value and makes them feel better about doing business with you. Live chat answering service representatives help you build stronger relationships that are based on trust because you’ll have higher customer satisfaction levels. In fact, you could experience satisfaction levels over 70%, compared to 61% for email support and 44% for traditional phone support.